If you are interested in adding the 'magic' of touch to control your electronics project, a capacitive touch sensor might be the way to go. This hookup guide will show you how to use the MPR121QR2 sensor. The MPR121QR2 is a capacitive touch sensor controller that makes it very easy to integrate capacitive touch sensing into your project. It communicates via I2C, and works by measuring the capacitance of twelve electrode points. When an object comes close to the electrode connector, the measured capacitance changes. This signals the MPR121 that something has touched a 'button'. The IC is also capable of driving LEDs or basic GPIO functionality on electrode pins 4 through 11, giving you a lot of freedom for setting up your project. The sensor works from 1.6V to 3.3V. The sensor isn't very current-hungry, drawing only around 29 µA when sampling every 16 milliseconds. You will also want a soldering iron, some hookup wires and a microcontroller capable of I2C communication. For our examples, we will be using an Arduino Uno. You will also need some kind of material to act as a capacitive sensing surface (also known as an electrode, which is not to be confused with the character Electrode. Generally, aluminum foil works well. However, you could also use coins, conductive paint, or copper tape. The MPR121 is very easy to get started using, especially with the example code. However, if you haven't worked with Arduino previously or aren't familiar with I2C communication, you should check out the tutorials below. 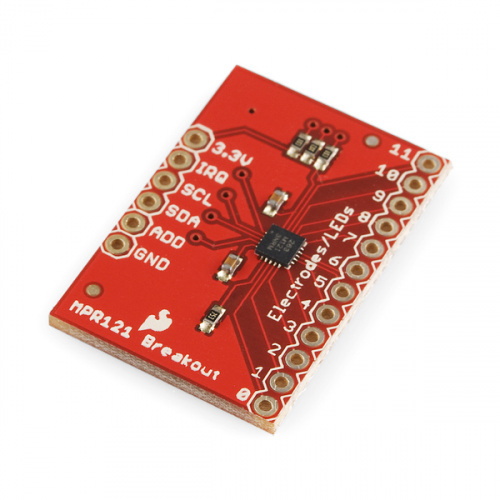 The SparkFun Capacitive Touch Sensor Breakout Board is the most versatile option of the three MPR121 products. You can wire it up to any kind of electrode you want, and, as it is a simple breakout board, does not have a particular microcontroller footprint it favors. The breakout board has 4 pins that need to be connected to your microcontroller at a minimum to get communication going: the power lines and the I2C lines. However, for our example, we are going to be also connecting the IRQ pin to more easily detect a change on one of the electrodes. You will also want to connect the Electrode/LED pins to your electrode material you selected previously. You will want to make sure you have a good, solid connection between your material and your board, so make sure you thoroughly solder your connections. Check out the Fritzing diagram below for how your connections should look. The yellow squares represent whatever material you decide to use for your electrodes. To communicate with your breakout board, you will need the Arduino sketch available as a zip file here. Alternatively, you can also find the most up-to-date firmware for working with the breakout board available on GitHub. Let's take a look and see exactly what the code is doing. In this first section of the code, the MPR121 library and the Wire library are initialized. The Wire library makes I2C communication easy to use on the Arduino. The sketch also defines digital pin 2 as the IRQ pin connection, and creates 12 instances of the boolean variable touchStates. For the second section of the code, we define the irqpin as an INPUT, telling the Arduino to monitor the digital signal coming in over that pin. Serial communication is also started at 9600 bps, s well as the Wire and mpr121 libraries. The main loop of the code is incredibly simple, as it only calls a single function. The function is actually described in the next section of the code. The Arduino requests the electrode states from the sensor in the first section, and the least significant bits and most significant bits are defined for the sensor. The Arduino scans each electrode and prints out a message over serial if an electrode is triggered as being touched. The Arduino will then print out a message as soon as the electrode is no longer being touched. The last major section of the code defines the threshold values for each electrode. Each electrode must have a touch threshold and a release threshold for the Arduino to compare the current state of the electrode. It looks like a lot of code, but it simply repeating the procedure of setting the threshold values for each electrode pin. The last two functions in the example sketch simply check the status of the irqpin to determine if the IC is signaling that an electrode has been touched. The very last function set_register simply runs the Arduino through the standard steps in the Wire library to write the registers to the IC. Now that you have a basic understanding of the code, let's start reading the data. Open up the sketch from the file you downloaded earlier, and upload it to your Arduino. Once it is uploaded, open the Serial monitor in the Arduino IDE. You should start seeing the Arduino print out sentences if you press any electrodes or release any electrodes. 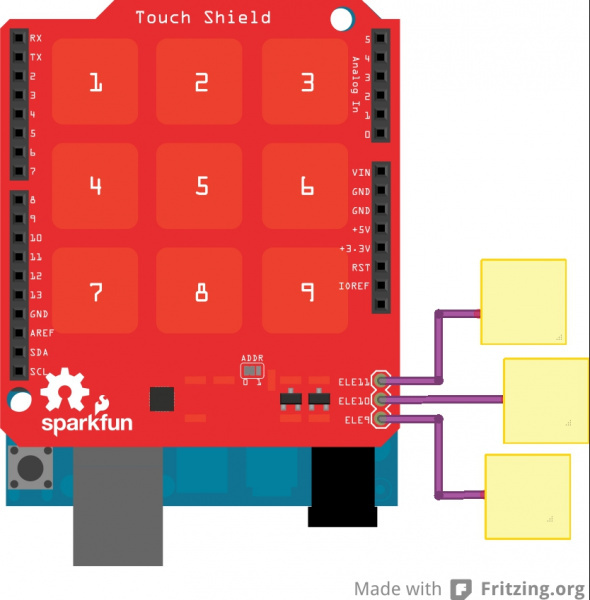 The SparkFun Touch Shield is an Arduino R3 compatible shield that enables capacitive touch capabilities for your project using the MPR121 IC. The shield itself has 9 touch pads on it (conveniently numbered 1-9 in a 3x3 grid), and has headers for 3 additional electrode connections. The shield connects directly to the 3.3V pin on the Arduino. There is no on-board voltage regulation on the VCC line, so keep that in mind if you intend to use this with a 5V Arduino Pro board. However, there is an onboard logic level converter to step down 5V levels to the 3.3V for the sensor's I2C lines. This shield is designed to interface with an Arduino Uno R3. You can use other microcontrollers as well with the same footprint, such as the Arduino Mega. You will need access to the I2C pins, SDA and SCL. Other than that, you will need access to the 3.3V and GND pins and to digital pin 2. This connects to the INT pin on the MPR121 sensor. We generally use stackable headers for attaching shields to Arduino boards, but you can use standard male headers if you prefer. The R3 Stackable Header Kit is the easiest option to use if you are planning on stackable headers. For detailed instructions on how to assemble your shield, have a look at our Shield Tutorial. The shield also has 3 pins labeled ELE9, ELE10, and ELE11. These correspond to electrodes 9,10, and 11 on the MPR121 chip. You can solder additional buttons or connections on to these pins at this time if you want more than the 9 buttons already available on the shield. However, you don't have to do this to get the shield to function. It's up to you! Check out the Fritzing diagram below to see how your shield should look if you have added buttons on to your shield on pins ELE9, ELE10, and ELE11. Note: The yellow squares represent whatever material you've chosen to use as your electrode. Once you've got your shield all hooked up, let's start pulling data from the shield! Once you've got your shield assembled, it's time to start talking to it! You can download the example code here, or find the most up-to-date version in the GitHub repository. Open up the Touch_Sensor_Shield_Example.ino file. The other files set the register definitions for the MPR121 chip, so you shouldn't need to mess with these at all. First thing the code shows is the pin definitions. This is laying out the keypad functionality (ONE, TWO, etc.) and defining which electrode pin corresponds to each number. As the comment states, electrode pins 9, 10 and 11 are not currently connected to anything, but if you did solder on additional buttons to those pins on the shield, you can change this. The interrupt pin is also defined as D2. This can't be modified without some hardware hacking on the shield, so keep that in mind if you are interfacing additional hardware into your set up. The setup loop starts by setting the interrupt pin as an input and pulling it high. The serial bus is started at 9600 bps. Next, the code initializes the I2C communication lines without using the Wiring library. The MPR121 chip is then configured with the proper sensitivity settings on the electrodes. The final step in the setup loop creates an interrupt in the code that will trigger when any of the buttons are hit. The loop function is actually empty currently, as the button presses use the interrupt we created in the setup loop. If you did have additional hardware you wanted to incorporate into your project, the code for it can live in this loop. The last two functions in the example code tell the Arduino to check the electrode states for a button press and what to print out when a button press is detected. The function getTouchStatus() actually returns at 16-bit value which gives the status of each button. The status of 1 indicates that an electrode is being activated. Now that you have basic communication up and running with your shield, you can start integrating this into projects. If you haven't yet connected anything to electrodes 9, 10 and 11, consider adding in additional buttons here. You will also need to update the code. You'll want to add the following block of code into the example sketch right before Serial.println(digits);. You can change the digits values to have the buttons output different values instead of "A", "B", or "C". 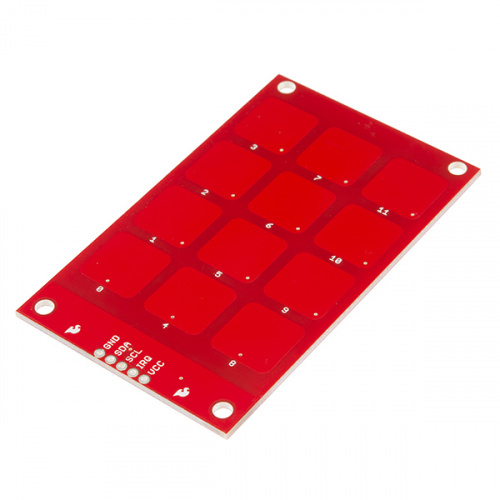 The SparkFun Capacitive Touch Keypad is very similar to the MPR121 breakout board, but instead of having to attach your own electrodes, this board comes with a 12-pin keypad built-in. Now that you've got your keypad hooked up properly, let's get communicating with it! In order to communicate with your keypad, you'll want to download the example sketch available here. Alternatively, you can check for the most up-to-date firmware available in the GitHub repository. This sketch is designed to allow the keypad to function as a phone keypad. Check out the pin mapping below to see how the numbered pads will print over the Serial terminal. This is defined in the first section of the code, shown below. The I2C address is also defined, along with setting digital pin 2 to be assigned as the IRQ pin connection point. The second section of the code is the basic initialization of the serial communication port at 9600 bps, as well as setting the IRQ pin as an input on the Arduino. It also starts the configuraton of the MPR121 IC. The main loop in the code simply scans the MPR121 electrodes and looks for a phone number to be entered on the keypad. This is the function getPhoneNumber(). The code then prints out the phone number dialed over the serial monitor. As you can see in the function loop for getPhoneNumber(), the Arduino checks the touchstatus register for each electrode and prints out the assigned value for any electrodes that are registering a touch. It also includes an error if multiple buttons are pressed simultaneously, printing over the serial monitor to tell the user to touch only one button. The next section of the code simply steps through the I2C communication to read data from the MPR121 IC. The function mpr121Write() is then defined, which again, steps through the I2C process of writing commands to the MPR121 sensor. The mpr121QuickConfig() function is then defined. In this function, all 12 of the electrodes are enabled, and the touch and release thresholds for all of the sensors are set. The filtering registers are also configured. // This group controls filtering when data is > baseline. // This group controls filtering when data is < baseline. The final section of the sketch simply reads the IRQ pin for an indication that an electrode has been pressed. It then returns either a 1 or 0 as the value for checkInterrupt() variable. Now that you know how the keypad works and communicates with the Arduino, you can start customizing your project and going further. Now that you've figured out how to use the various versions of the MPR121 IC, what kind of cool projects can you come up with? If you have any questions still, check out the additional resources below, or feel free to leave a comment on the tutorial. All of these tutorials have I2C communication. They can also both be used in conjunction with this sensor to act as a display for the button triggers or to monitor the temperature as well.